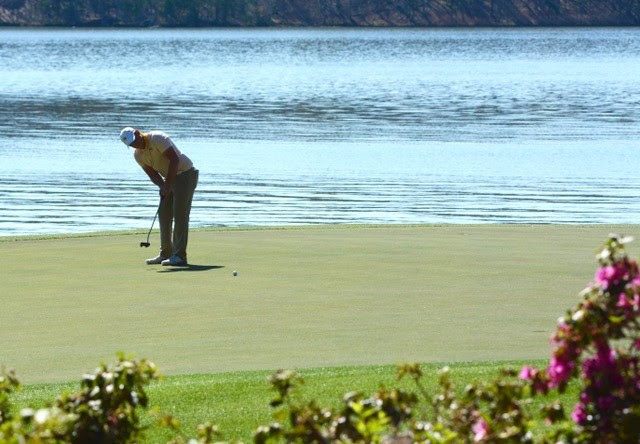 Greensboro, GA (March 6, 2018) – Regarded as one of the best collegiate golf events in the nation, the 13th annual Linger Longer Invitational (LLI) at Reynolds Lake Oconee will take place at the award-winning Great Waters course, March 17-20, 2018. The Linger Longer Invitational showcases leading collegiate players from around the country as they vie for the coveted individual and team titles in a 54-hole stroke-play tournament. Three-time LLI team champions, No. 2-ranked University of Alabama, will return to Reynolds Lake Oconee to defend their title against a strong field of competitors, including four-time LLI champion and last year’s 3rd-placefinisher, the University of Georgia. Some of the most competitive college golf programs in the country will contend for the title, including: Augusta University, Charlotte University, Kennesaw State University, Mercer University, Middle Tennessee State University, Ohio State University, Penn State, Troy University, University of Akron, University of Cincinnati, University of Michigan, University of North Carolina-Greensboro, University of Tennessee-Chattanooga, and University of Virginia. The 2018 event welcomes another stellar individual field, including some of the country’s top-ranked collegiate golfers. Among them is Athens, Ga., native Kyle Mueller, a senior at the University of Michigan, who is ranked 7th and University of Alabama junior Davis Riley, who is currently ranked No. 9. The first 12 years have seen many future PGA TOUR champions compete in the LLI, including Justin Thomas (Alabama), Rickie Fowler (Oklahoma State), Russell Henry (Georgia), Chris Kirk (Georgia), and Kyle Stanley (Clemson). Last year’s individual winner, Greyson Sigg (Georgia) is now on the Mackenzie Tour-PGA TOUR Canada, with four top-10 finishes. The Linger Longer Invitational has been held at three of Reynolds Lake Oconee’s six golf courses – twice at the Oconee (2006, 2007), followed by three years at the Landing (2008-2010), and at Great Waters since 2011. Great Waters, consistently ranked among America’s Greatest 100 Public Courses by Golf Digest, is a Jack Nicklaus Signature golf course, and will undergo a total renovation beginning in June. One of the more unique provisions of the Linger Longer Invitational is the housing, which is provided by Reynolds Lake Oconee members. The host families are able to personalize the experience for the teams and provide a ‘home away from home’ during the competition. For more information about the Linger Longer Invitational, including live scoring, please visit https://www.reynoldslakeoconee.com/linger-longer-invitational. Surrounded by more than 350 miles of majestic shoreline on Georgia’s historic Lake Oconee, the golf destination resort community of Reynolds Lake Oconee features six championship golf courses and is home to The Reynolds Kingdom of Golf presented by TaylorMade, a world-class instructional and club fitting facility. Located between Atlanta and golf’s legendary grounds in Augusta, Reynolds Lake Oconee is an outdoor recreation paradise that includes the Sandy Creek Sporting Grounds, award-winning tennis center, swimming pools, pedestrian trails, wellness campus, and full-service marinas to facilitate water sports. Guests can choose private accommodations that include luxury resort condominiums and cottages, or The Ritz-Carlton Reynolds, Lake Oconee, a 251-room lakefront resort and spa named a 2016 AAA Five Diamond Lodging and 2015 Forbes Four-Star resort. Dining is available at ten distinctive culinary venues. Originally established in 1988 as Reynolds Plantation, Reynolds Lake Oconee is located roughly 90 miles from Atlanta’s Hartsfield-Jackson International Airport. For more, reynoldslakeoconee.com.